As promised in our previous blog post highlighting the many repair services, factory maintenance jobs and performance upgrades that HOUSE Automotive offers, we’re back! 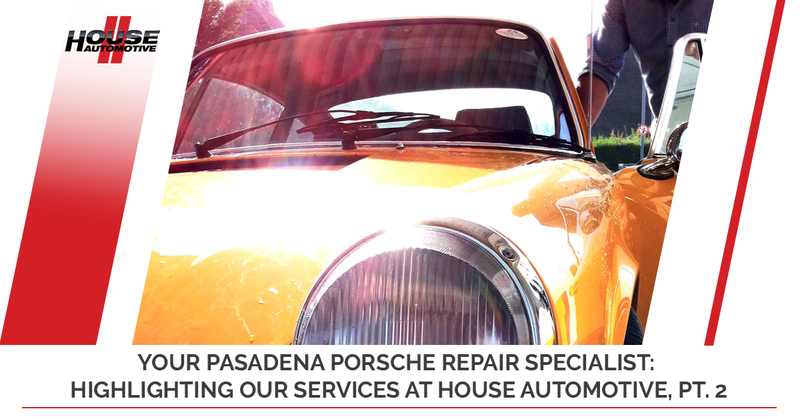 Designed to provide Porsche owners around Pasadena and the greater Los Angeles area with a reliable, comprehensive Porsche service provider, we’re proud to offer our fellow Porsche owners with a specialized experience that goes way beyond what people traditionally expect from a mechanic. Since we service so many specific models of Porsches, our factory-certified service center had to break this series into two posts. Continue learning more about what HOUSE Automotive has to offer below! As a routine check, Porsche recommends airbag maintenance every four years, and then every two years after your vehicle turns eight years old. HOUSE Automotive checks the airbag control units, impact sensor, seat belt buckles sensor, the seat belt sensor itself, and so on. In case of an impact, we want all components to communicate with each other. We might be an independent Porsche repair shop in Pasadena, but that doesn’t mean that we don’t do things by the book as mandated by Porsche themselves. Visiting HOUSE Automotive for any of our services does not and will never void your warranty. Unless you drive the original Porsche 356, the chances are that we can work on your Porsche without any issues! Aftermarket upgrades can be sketchy, but when you work with a reputable team of certified professionals, we can help boost the performance of your ride by upgrading your intake and air filter. HOUSE Automotive carries BMC air filters for 911 Carreras as well as IPD Plenum intake installation to increase the horsepower and torque of your Cayenne. We’re as passionate about delivering more power to your vehicle as you are — just make sure to contain all of that power safely and keep it to a track day instead of public roads! Curious about upgrading to an aftermarket Porsche exhaust system? Raw acceleration is one thing, but really hearing your engine roar as you put your foot down (obligatory disclaimer: again, HOUSE Automotive does not condone dangerous or reckless driving) is nothing shy of epic. Our independent Porsche mechanics work closely with performance specialists Sharkwerks and Evolution Motorsports to bring you exciting net performance gains and louder, richer notes coming out of your exhaust on various 911 models. Really, it’s hard to argue with the thrill of a screaming engine. Then again, that could be the passenger in your vehicle. We also work closely with EVOMSit and their legendary 991 software kit. Designed to increase the power of your 911 (991) through a software-only tune or a full-on stage 1 tune, this is a simple and surprisingly effective way of getting more response when you put the pedal to the metal. Thanks For Reading — Our Pasadena Porsche Service Center Will See You Soon! If you’ve got a Porsche with any issues whatsoever, then we’d love to help you out. Simply put, that’s our passion. Until we see you visit our Porsche service center, you can visit here for care tips. Before or after visiting us, HOUSE Automotive wishes you many joyous, exciting and problem-free miles!